How did the latest Holimites Trail Running tour come about? With no real intention, we realized Holimites had been offering something new in trail running activities every 3 years. Our first hut-to-hut trail running tour across the Dolomites was in 2007; this covered the traditional paths of the Alta Via 1. Trail running on the Alta Via 2 followed in 2010. In 2013, we asked clients which were their favorite runs and stops along the AV1 and AV2. What resulted is a tour that has become our absolute bestselling sports package: “The Best of Alta Via 1 and 2” for trail runners. It combines the most stunning locations of the Dolomite’s classic AV1 and 2. The summer of 2016 will introduce Holimites’ newest trail running bonanza. 1) It can’t be a carbon copy of one of the classic Dolomite Alta Vias and it has to avoid the same trails we already offer in other programs. This time around we wanted to spice things up by creating our own, unique signature tour. 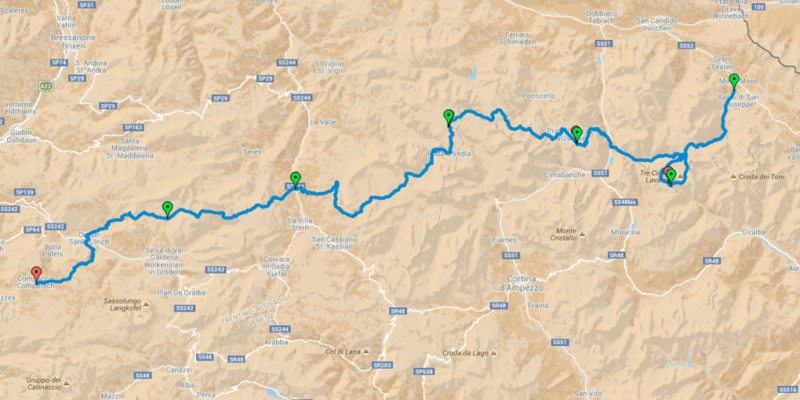 Thanks to the multitude of trails that connect Dolomite mountain huts, it’s pretty easy to put together a beautiful itinerary like pieces of a big puzzle. Although we weren’t able to totally avoid stretches along trails offered on our other programs, we were able to limit this to just 8 km of the total 106 km…and those 8 are distributed throughout the stages. Not bad! As we charted the route on paper, in-house we affectionately baptized the new traverse: “The Holimites Alta Via”. 2) It has to give the “Wow” effect. Of course, the Dolomites are famous for flaunting a plethora of breathtaking scenery and trails set amongst spectacular peaks. But, when pressed to choose, which highpoints are really “postcard perfect” and will last significantly in a trail runner’s recollection? 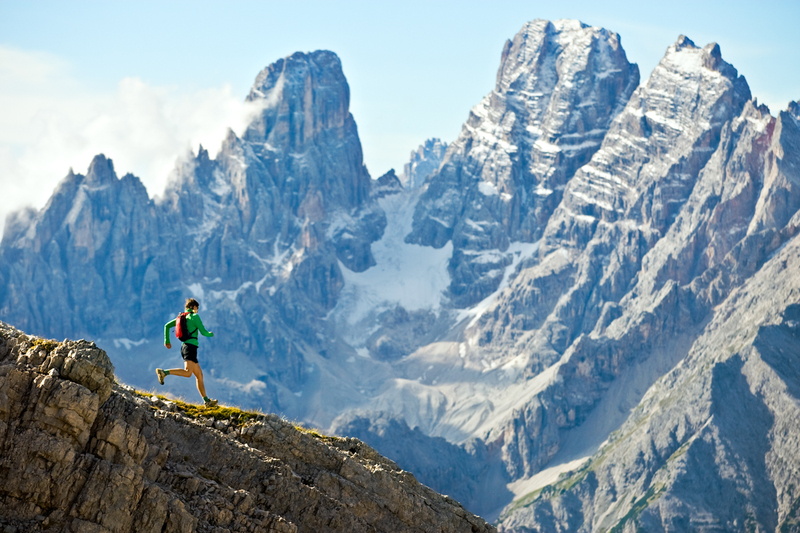 Close your eyes and imagine you’re running through the first trail stage at the foot of the 3 Cime di Lavaredo. Your guide stops you and he or she points out the mountains that you will cover on your first 3 stages. The same thing will happen every day: you’ll get a sneak-peak of the next 3 stages in your scenic odyssey. “Wow”! 3) It has to have the best trails suited to running. The Alta Vias 1 and 2 tours mirror the classic outdoor hiking route that, in certain spots, can be demanding to run on unless you’re a hardened vet like Kilian Jornet or Jenn Shelton (who was our trail running guest a few years ago). That’s why we designed the “Best of Alta Via 1 and 2″ program. We wanted to push ourselves a little further on our newest tour. Hut-to-hut and stage-to-stage, we chose the trails that are most appropriate to trail running without compromising stunning panoramas of the Dolomite Mountains. That’s how the Trail Running Dolomites Traverse was born! (Between you and me, we won’t mind if you call it the Holimites Alta Via.) An extraordinary running adventure through the Dolomites, following dawn to dusk from East to West! Anxious to know more? Dates and details are available on our website at the following link. By the way…did you count how many times we repeated the number “three”? That means, if you’ve already strutted your stuff with us on two of our Dolomite trail running programs…as the old saying goes: All good things come in THREES! This post is also available in Deutsch and Italiano. This entry was posted in Summer, Trail Running and tagged dolomites, running, Trail Running, trailrunning on November 17, 2015 by holimites. How long did it take to make the new holimites.com website? What‘s behind the making of a Holimites catalogue? Spring? | The official Holimites blog on Winter 2013 .. bye bye!